The Chicago Cubs have jumped on the bandwagon of contending teams acquiring starting pitchers. 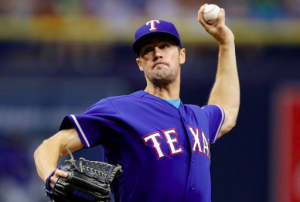 Late night Thursday, the Cubs agreed to a deal with the Texas Rangers for starter Cole Hamels. The Rangers will receive pitcher Eddie Butler, minor league pitcher Rollie Lacy, and a player to be named later. Texas is also reportedly covering much of Hamels’ remaining salary. That has forced the Commissioner’s office to sign off on the trade. The 34-year old Hamels is currently mired in a slump. In 20 starts this season, he’s just 5-9 with a 4.72 ERA. Those numbers have spiked after a recent stretch of poor outings. In the middle of June, his ERA was 3.41. But in his last five starts, Hamels has given up 25 earned runs in 22 innings. Nevertheless, the Cubs are looking for rotation help. Yu Darvish has been on the DL since the end of May. Kyle Hendricks and Jose Quintana have not pitched to the level the Cubs had anticipated before the season. Tyler Chatwood has also struggled to solidify the back of the rotation. Jon Lester is the only member of Chicago’s rotation who has lived up to preseason expectations. The Cubs know how good Hamels can be when he’s on. His vast playoff experience doesn’t hurt either. Chicago is betting that Hamels can turn things around after going to a contender. It’s unclear if the Cubs will pick up the $20 million option Hamels has for 2019. It’s believed Hamels required that in exchange for waiving his no-trade clause. With Chicago’s entire rotation under contract for next season and Drew Smyly returning from Tommy John, it could be hard to find room for everyone. But the Cubs will likely worry about that later. For now, they are hoping that Hamels can help them hold off the Brewers in the NL Central and make another run to the World Series. As for the Rangers, this trade seems like a salary dump more than anything. Hamels has a $22.5 million salary and they would have needed to pay $6 million to decline his 2019 option. That financial flexibility could help them as they look to rebuild over the winter. In terms of the prospects, Butler has been up and down as a starter in the big leagues. The Cubs have only used him as a reliever this year. Lacy, meanwhile, is a rather unheralded prospect. He has struggled in his first couple of outings since being promoted to advanced-A. Neither projects to make a significant impact in the majors. This trade isn’t a slam dunk for the Cubs either. With the way Hamels has pitched in July, there’s no guarantee a change of scenery will help. However, the upside is still there for Hamels. His track record of success in the postseason could also pay dividends. In that sense, trading for Hamels could be worth a shot.